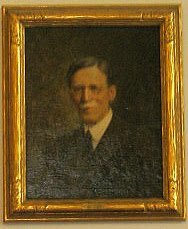 The Honorable Hascal Russel Brill served as a Second Judicial District Judge from 1875 until his death in 1922. Judge Brill was elected as a probate judge in 1872, at the age of 26. Three years later he was appointed judge in the Court of Common Pleas. In 1876, the Court of Common Pleas was merged with the Second District Court, and Judge Brill became the first person to occupy the second seat (Orlando Simons, also of the Court of Common Pleas, was appointed to the third seat). Born in Quebec, Canada in 1846, Brill moved to Kenyon, Minnesota as an adolescent with his family of farmers. He later attended both Hamline University at Red Wing and the University of Michigan. He worked as a school teacher for a year before working in the office of the first Second Judicial District Judge, Judge E.C. Palmer. In 1873, Judge Brill married Cora A. Gray at Niagara Falls. They later had six children. One of those children, Kenneth Gray Brill, followed in his father’s footsteps and became a Second Judicial District Judge. The Law Library has on display judicial portraits of past Second Judicial District Court judges, going back to 1857. If you have any information or commentary about Judge Brill, please leave a response or send us an e-mail. To view the portraits in person, visit us on the 18th floor of the Ramsey County Courthouse.